574 pages | 18 B/W Illus. In the new world of work and organizations, creating and maintaining a positive identity is consequential and challenging for individuals, for groups and for organizations. New challenges for positive identity construction and maintenance require new theory. This edited volume uncovers new topics and new theoretical approaches to identity through the specific focus on positive identities of individuals, groups, organizations and communities. This volume aims to forge new ground in identity research and organizations through a compilation of new frame-breaking chapters on positive identity written by leading identity scholars. 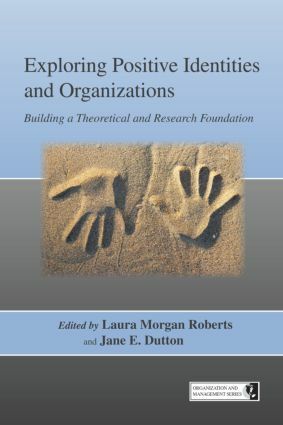 In chapters that build theoretical and empirical bridges between identity and growth, authenticity, relationships, hope, sustainability, leadership, resilience, cooperation, and community reputation and other important variables, the authors jumpstart an exciting domain of research on new ways that work organizations are sites of and contributors to identities that are beneficial or valuable to individuals or collectives. This volume invites readers to consider, "When and how does applying a positive lens to the construct of identity generate new insights for organizational researchers?" A unique feature of this volume is that it brings together explorations of identity from multiple levels of analysis: individual, dyadic, group, organization and community. Commentary chapters integrate the chapters within each level of analysis, illuminate core themes and unearth new questions. To map out a vibrant new research territory in organizational studies . This volume will appeal to an international community of scholars in Management, Psychology, and Sociology, as well as practitioners who seek to generate positive identity-related dynamics, states and outcomes in work organizations. A.P. Brief, J.P. Walsh, Series Foreword. Part 1. Introduction. J.E. Dutton, L.M. Roberts, J. Bednar, Positive Identities and Organizations: An Introduction and Invitation. Part 2. Positive Identities and Individuals in Organizations. G.E. Kreiner, M.L. Sheep, Growing Pains and Gains: Framing Identity Dynamics as Opportunities for Identity Growth. S. Maitlis, Who am I Now? Sensemaking and Identity in Posttraumatic Growth. A. Carlsen, T. Pitsis, Experiencing Hope in Organizational Lives. B.B. Caza, M.G. Wilson, Me, Myself, and I: The Benefits of Work-Identity Complexity. N.P. Rothbard, L. Ramarajan, Checking Your Identities at the Door? Positive Relationships Between Non-Work and Work Identities. L.M. Roberts, S.E. Cha, P.F. Hewlin, I.H. Settles, Bringing the Inside Out: Enhancing Authenticity and Positive Identity in Organizations. B.E. Ashforth, Commentary: Positive Identities and the Individual. Part 3. Positive Identities and Relationships in Groups and Organizations. C.D. LeBaron, P. Glenn, M.P. Thompson, Identity Work During Boundary Moments: Managing Positive Identities Through Talk and Embodied Interaction. D.S. DeRue, S.J. Ashford, N.C. Cotton, Assuming the Mantle: Unpacking the Process by Which Individuals Internalize a Leader Identity. B.R. Ragins, Positive Identities in Action: A Model of Mentoring Self-Structures and the Motivation to Mentor. S. Kopelman, L.L. Chen, J. Shoshana, Re-Narrating Positive Relational Identities in Organizations: Self-Narration as a Mechanism for Strategic Emotion Management in Interpersonal Interactions. L.P. Milton, Creating and Sustaining Cooperation in Interdependent Groups: Positive Relational Identities, Identity Confirmation and Cooperative Capacity. L.H. MacPhail, K.S. Roloff, A.C. Edmondson, Collaboration Across Knowledge Boundaries within Diverse Teams: Reciprocal Expertise Affirmation as an Enabling Condition. J. Sanchez-Burks, F. Lee, Commentary: The Elusive Search for a Positive Identity: Grappling with Multiplicity and Conflict. Part 4. Positive Identities and Organizations and Communities. K.G. Corley, S.H. Harrison, Generative Organizational Identity Change: Approaching Organizational Authenticity as a Process. M.G. Pratt, M.S. Kraatz, E. Pluribus Unum: Multiple Identities and the Organizational Self. S.L. Brickson, G. Lemmon, Organizational Identity as a Stakeholder Resource. A. Hamilton, D.A. Gioia, Fostering Sustainability-Focused Organizational Identities. C. Marquis, G.F. Davis, Organization Mechanisms Underlying Positive Community Identity and Reputation. M.A. Glynn, I.J. Walsh, Commentary: Finding the Positive in Positive Organizational Identities. Part 5: Conclusion. L.M. Roberts, J.E. Dutton, J. Bednar, Forging Ahead: Positive Identities and Organizations as a Research Frontier. Laura Morgan Roberts is an assistant professor of organizational behavior at the Harvard Business School. She is a graduate of the University of Virginia (BA, Psychology) and the University of Michigan (MA and Ph.D., Organizational Psychology). Laura's research program examines positive identity processes in diverse organizational settings. She speaks to the role that leadership plays in creating work contexts where employees can engage authentically and contribute from a position of strength. She also investigates how employees of diverse professional and cultural backgrounds leverage their identities as strengths that create value, build connections, and foster personal fulfillment. Jane E. Dutton is the Robert L Kahn Distinguished University Professor of Business Administration and Psychology at the University of Michigan. She is currently the co-director of the Center of Positive Organizational Scholarship at the Ross School of Business (http://www.bus.umich.edu/Positive/). She edited the book Exploring Positive Relationships at Work with Belle Ragins in 2007. Jane’s research interests are on the processes that generate flourishing in work organizations. She studies positive identity, compassion at work, high quality connections and job crafting. The Organization and Management Series publishes books that establish innovative avenues of inquiry or significantly alter the course of contemporary research in an established area. Taking a broad view of the domain of organization and management scholarship, the editors seek to publish theoretical and empirical works grounded in a variety of disciplinary perspectives that focus on units of analysis ranging from individuals to industries. In addition, the series welcomes purely methodological contributions, as well as edited volumes of original essays. Manuscript proposals should be sent to: Art Brief, Department of Management, University of Utah, 1645 E Campus Center Drive #105, Salt Lake City, Utah 84112-9304 (arthur.brief@business.utah.edu), Michael Frese (michfrese@googlemail.com), Kim Elsbach (kdelsbach@ucdavis.edu), and Christina Chronister (christina.chronister@taylorandfrancis.com).